"What kind of man gives cigarettes to trees?" The Survivors is a rather odd little picture, a satire of the survivalist movement of the 1980s (people who seclude themselves in personal weapons strongholds out in the middle of nowhere and await Armageddon) that was born out of a combination of Cold War paranoia, anti-government sentiment, and a poor economy. Donald (Robin Williams) has already been having a rough day (having been fired from his job by a talking parrot) when he runs into Sonny (Matthau) at a local diner. Sonny's day hasn't been great either�he's lost his gas station business, which literally went down in a ball of flames, and has been denied unemployment payments. Things get worse when the diner is robbed at gunpoint, but Sonny and Donald manage to foil the robber's (Jerry Reed) plans. He escapes, but he knows they've seen his face and makes plans to eliminate the witnesses against him. After another run-in with the criminal, Sonny and Donald enroll in a survivalist training camp and hunker down in an isolated, custom-built "end of the world"-proof shack, preparing for the worst. Two generations of comedic legends come together in the pairing of Robin Williams and Walter Matthau, with the former's manic babbling contrasted against the latter's dry sarcasm. They make an appealing duo, even if they don't have the best material to work with�Michael Leeson's screenplay is mean-spirited and rather obvious at times, and while some of the humor stemming from the characters' paranoia is cute, by the time everything disintegrates into a shootout in the final reel, the laugh out loud comedy has pretty much disappeared. Michael Ritchie, who tackled social satire with his 1975 beauty pageant spoof Smile, does his best to bring out the broader, more comical aspects of the screenplay, allowing Williams to do some of his patented improvisation, but again, the final act gets away from him, and the action scenes at the end are either overdone or not over-the-top enough�regardless, they seem forced, jarring, and out of place. Removed from context, The Survivors is perhaps less effective than it once was. Though the actors give good performances in rather poorly defined roles, even the comfortable pairing of Williams and Matthau can't totally redeem a miscalculated last act. Image Transfer Review: Considering the age of the film, this is a very nice-looking transfer, especially considering the notoriously cheap film stock used in the 1980s, much of which has aged very poorly. Source material shows only a few marks and scratches, and an acceptable amount of grain. Colors are very bright without looking too grainy or oversaturated. Black level is fine, and while shadow detail in the darker scenes could be better, they still look fairly good. I didn't notice any glaring video noise or aliasing. Audio Transfer Review: Audio is presented in English and French mono. It's a fairly clean track with no audible background hiss and good balance between dialogue, score, and sound effects, but overall, it sounds a bit muffled or flat, especially some of the more robust action scenes towards the end of the film. Still, not bad for a mono presentation. Extras Review: Extras are limited to a healthy 28 chapter stops, subtitles in seven different languages, and trailers for the feature, Jawbreaker, and The Big Hit. Don't ask me why those particular trailers were chosen. I just work here. 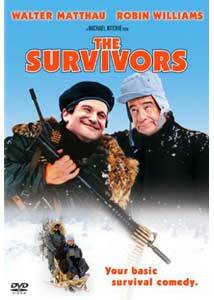 The Survivors may be an uneven satire, but where else can you see the comedy team of Robin Williams and Walter Matthau? Nowheres, I tell 'ya.